Motorcycling is a hobby to me. 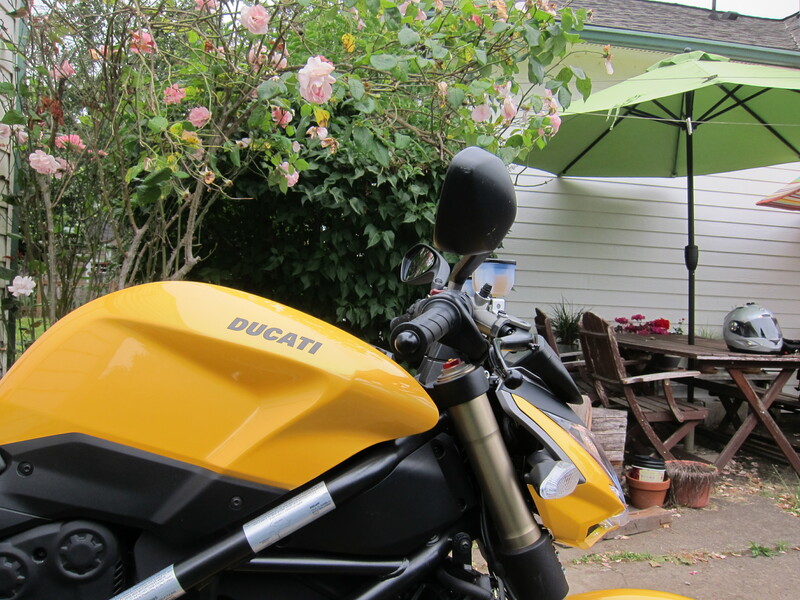 The bikes stay in the garage until the weekend or the holiday or the vacation arrives. Several acquaintances of mine do not know this blog exists. The Result: if I don’t tell I ride motorcycles, people who may see me on a regular basis at work or other activities, but who do not know me well, do not know that I ride or how important riding is for me. And I know of several others who are this same way. Point in case, a few months back when I was at the Ducati shop looking at the Streetfighter 848 I ran into one of my soccer friends, people I only see at the pitch, once a week or so. We were both surprised to see each other there, looking at the same bike. He was negotiating his ST2 for something else. Eventually he bought a KTM Super Duke. 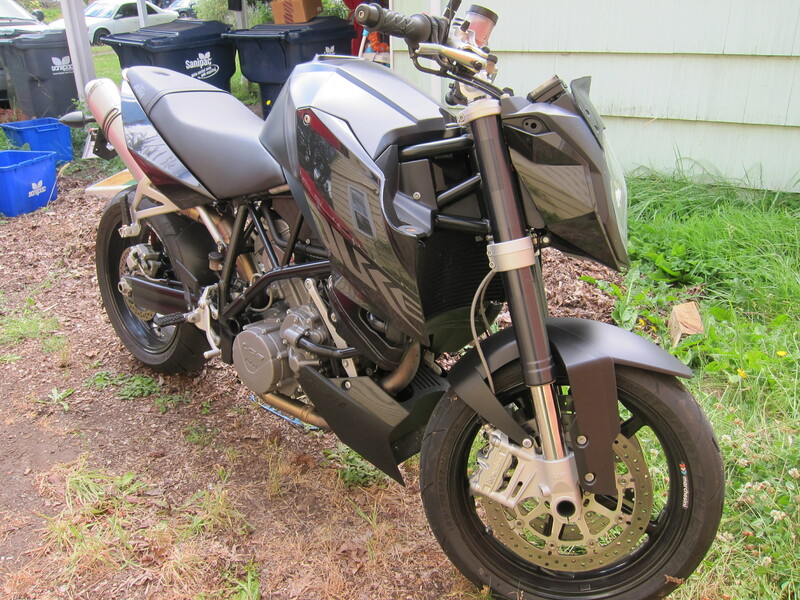 And as you know, I bought the Streetfighter 848. We talked while there and we decided to go for a ride “one of these days”. Eventually we connected in one of our soccer matches and the “one of these days” became July 15th. We started without much of a plan, and in the end we rode one of the variations of my Pacific Loop, but in the clockwise direction. Although the winds seem more favorable going north on the coast, I like better the south route, as it is easier to stop and enjoy the views if I decide so. 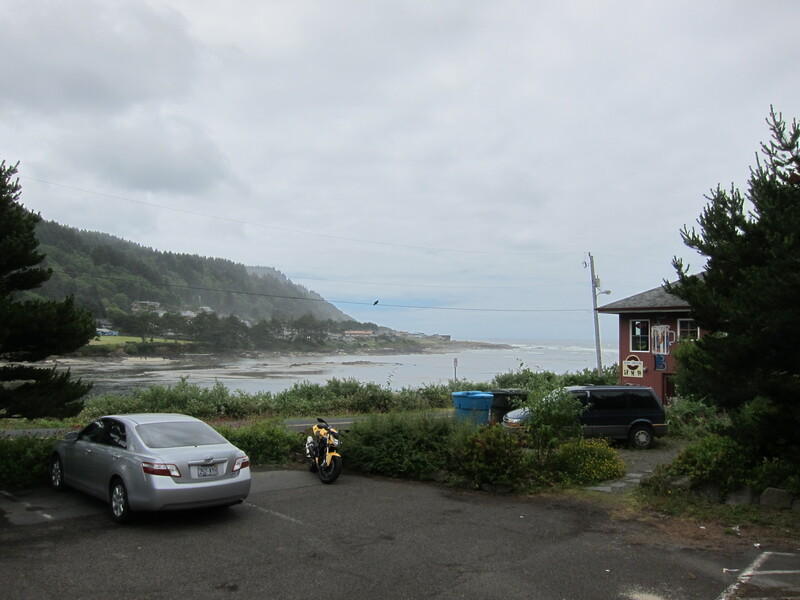 Besides stopping for gas, and for deciding which way to go, we only really stopped when we got hungry and decided to have a lunch break in Yachats. This was my first time in this restaurant, the Ona Restaurant. From the outside seating area you have this view. Not the best, but the ocean is there. I’ve been once to the restaurant on the red building (on the right on the photo above) before. It is cozy but it is a much smaller operation and at lunch time staff may get overwhelmed if too many customers show up. It is actually more like a bar. The Ona Restaurant is a better structured restaurant and offers a more varied menu. The food was excellent and I will definitely go back there. 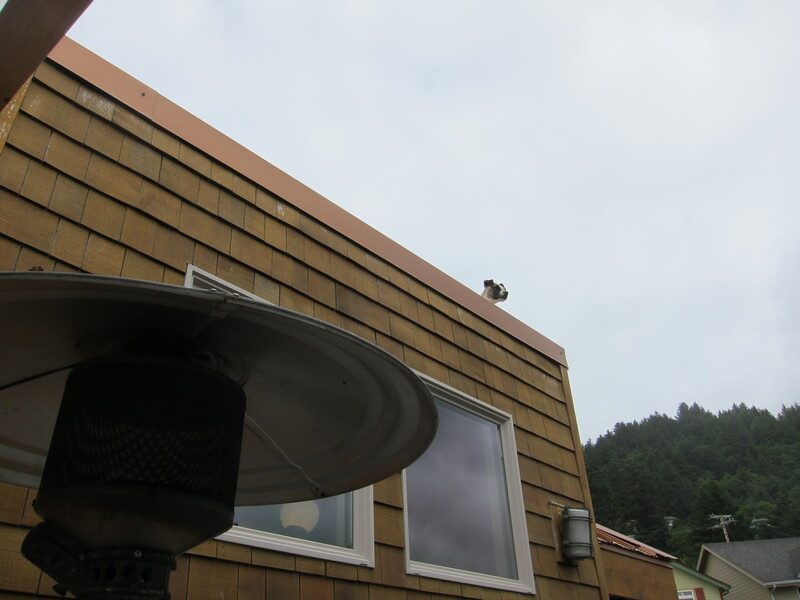 As we were seating outside, we heard people talking about a dog on the roof, and looking up and pointing to the roof. 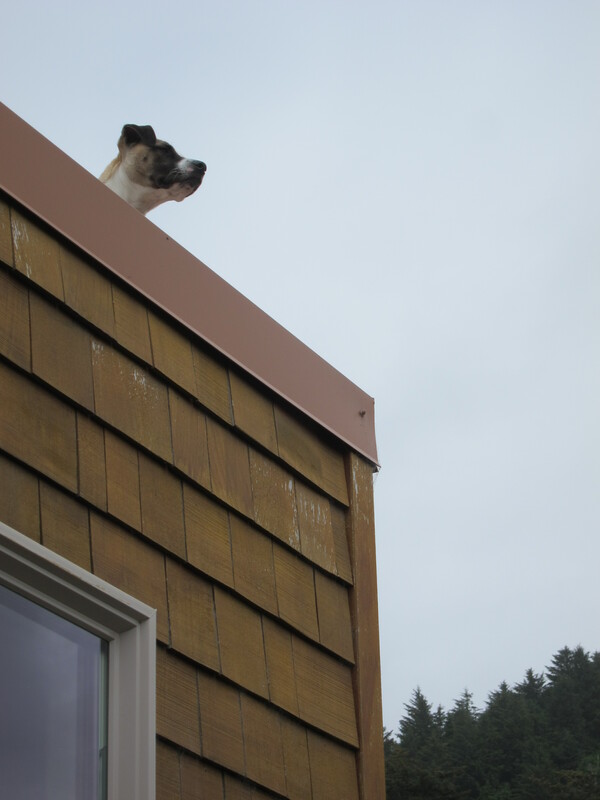 I had to see what that was all about – yes, there was a dog on the roof. And a very intent dog at that! I do the great majority of my rides by myself. But it is good to be with someone else every now and then. I have my riding friends, people who I already know for a while and with whom I’m comfortable riding together. When riding with someone new, that’s when you learn about their riding style. Everyone rides their own ride. So to be riding together may involve some issues and compromises. But in this case, his speed was very similar to mine and the idea of slow on straights and somewhat faster on curves was the same. In the end, we were riding at a similar pace. I didn’t take many photos during this trip. We were always on the move. 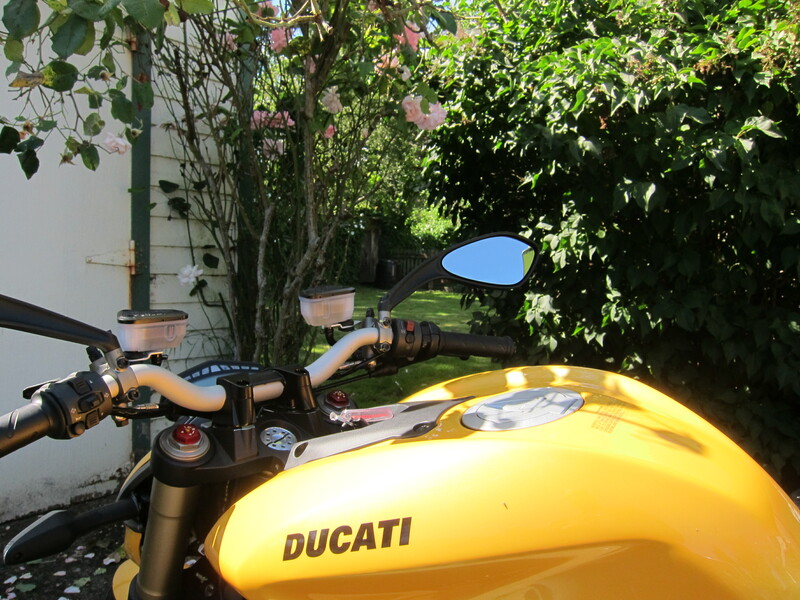 Once back in Eugene we said our goodbyes and agreed to go riding again. His job keeps him away from Eugene a lot, especially during the summer (a job I would not have if it would keep me away from my bike in the summer), so it may be a while until we ride together again. It was great to know one of my soccer friends is also a rider. During today’s ride the bike finally completed enough miles to complete the official break in period suggested by Ducati. 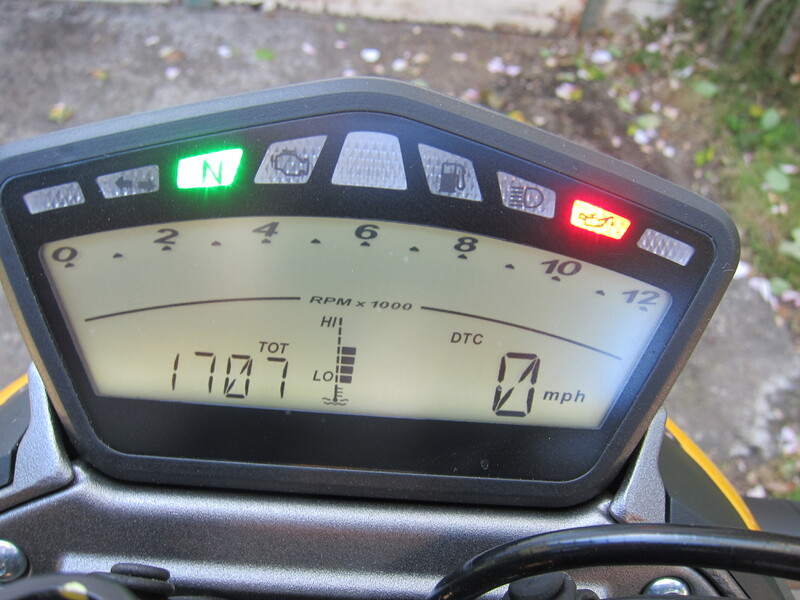 The ride was 232 miles long (371 km). Next ride report: checking out Oregon’s Triangle Lake, from above. 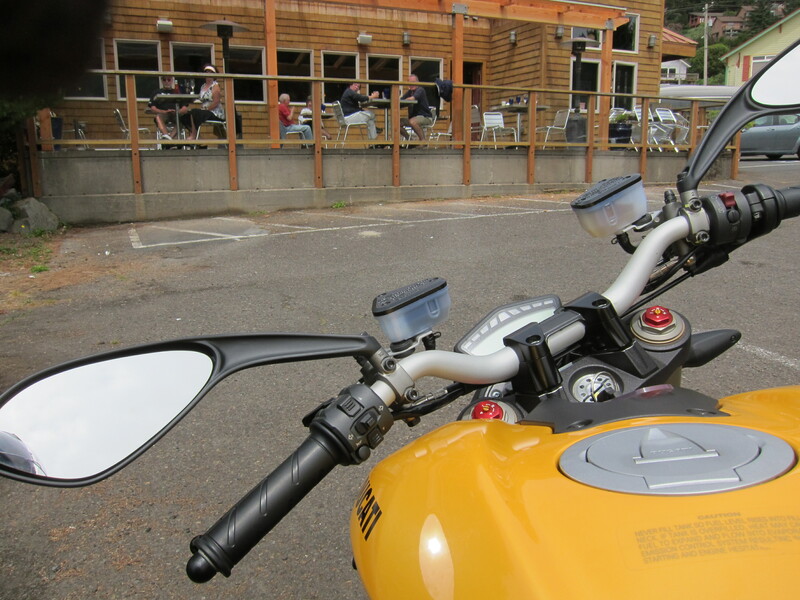 This entry was posted in Riding the Ducati and tagged Ducati, ona restaurant, Oregon coast, Streetfighter 848. Bookmark the permalink. It is best to have a mix of riding with others, and riding alone. I had always been a group rider and riding solo is a new experience for me. I find that being alone you can stop, take photos, or not stop. You have choices. In a group you are stuck with whatever the leader decides. Not everyone I know knows that I ride either and they are surprised when then find out that I had ridden to Montana or Oregon. They all wished they could ride too, but never learned. I like to meet people and disappointed that you weren’t free to meet when I was in Eugene for the night. I like riding with others but I certainly prefer riding solo. I feel it is better for the meditation side of the riding experience, and it brings more of the adventure feeling onto the ride. Sorry I missed you when you were here – that was the worst week of all the weeks so far in terms of intense activity.This summer has been the summer from hell. I’ve “volunteered” (well, people volunteered me) to so many projects, it has kept me away from taking days off during the week. I had several riding plans but in the end, I’m riding on Sundays only. My projects are being completed so it is likely I will be able to plan some days off soon, before the summer is over. Yes, that underground pub was good and unassuming. But a group of people showed up just before I arrived and it took at least 15 minutes just for the server to talk to me, another 30 minutes to get my burger. The Ona Restaurant is more upscale but it is not too expensive and there are more choices. I went back to the Ona a couple of weekends ago. Eventually I will get to report that trip as well. See, for me that’s different. People who see me on a regular basis dont’ know I own a car as my commuter vehicle has two wheels, too. I leave my Harley for weekend trips and touring, while my scooter is my work horse. I used to ride alone a lot, especially because I simply do not like group rides, and adjusting to other peoples pace, but since my hubby got into two-wheeling it is less and less. It is good to have a riding buddy but sometimes I need my little excapes and stop to smell the roses and take pics whenever I want. Your commuter vehicle is a scooter/motorcycle and you live somewhere where the weather is colder than here… Good for you Sonja! When I lived in a large city in Brazil I used to ride everywhere, I used to lane split and it was fun. Here in Oregon you can’t lane split. Riding a motorcycle is not a traffic saver and Eugene is such a small town, and there is no traffic. I go by bicycle to work, almost exclusively on a bike path – you can see my two posts called “commute to work” to see how nice that is. I use my truck once or twice a week during the summer. My car only leaves the garage some 5-6 times during the entire year, when I travel to Portland. It just doesn’t make too much sense to ride my motorcycle and still be ATGATT (all the gear all the time). About riding on groups, we share that same interest on the advantages of riding solo. And when riding with a close friend, in your case your husband, it is easier for both to compromise. 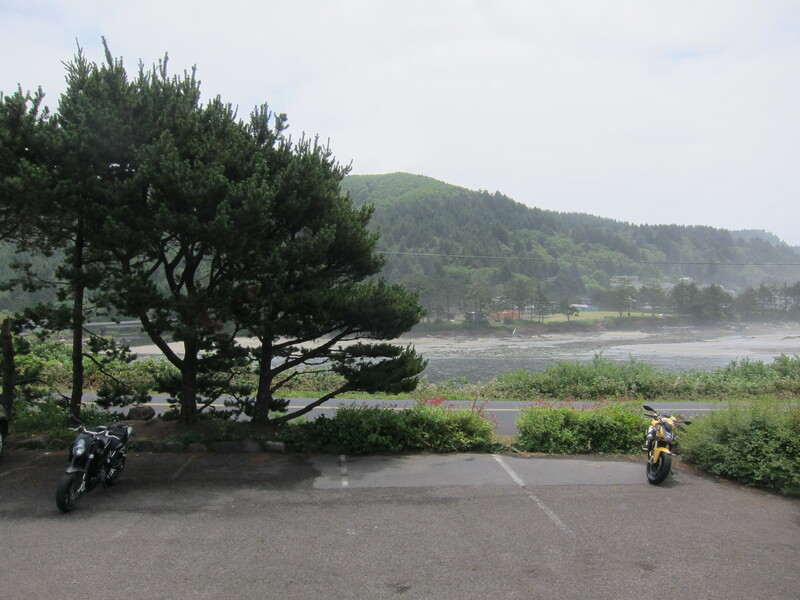 But most of my adventure riding plans (or dreams) are about riding by myself into the wild. I’ve done a few rides like this, here in Oregon (1,000 miles of Oregon Dirt). Or some day-rides by myself, like my ride on the Steens. And it really was a thrill. I like that adrenaline effect and the adventure feeling that comes from self reliance. Cesar, i love your posts. I’m saving my pennies for a SF848 as well. Thanks to you I have fresh wallpapers for my computer every week! It certainly looks like the SF is becoming your go to bike. I appreciate your McQueen quote. Keep up the good work. Thanks Greg. It is a very nice and sweet bike. Just about now I’m getting ready to take it for another ride.